Featuring low THD+N, low EMI and high PSRR, the PAM8106 is a 10 W stereo Class-D audio amplifier that integrates spread-spectrum modulation (SSM) and non-clipping power limit (NCPL) technology to deliver advanced features for a range of battery- or line-powered devices including LCD TVs, wireless speakers, portable stereos, and game machines. 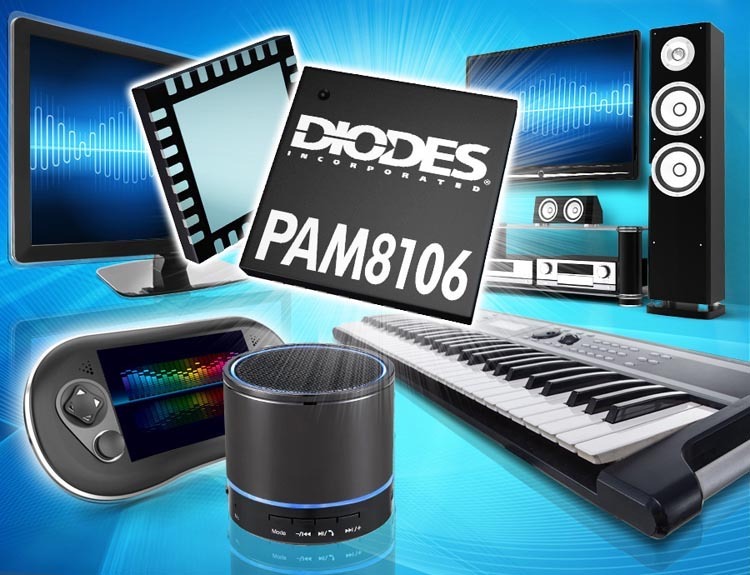 The PAM8106 operates from a wide input voltage range (4.5 V to 15 V) and is capable of driving both 8 Ω and 4 Ω speakers, which are popular in portable speaker applications. Its high efficiency of up to 92% minimizes heat generation, removing the need to for heat-sink hence avoiding the cost, weight and space associated with adding a heat-sink in the final application. With a low quiescent current of just 15 mA, the PAM8106 is well-suited for Li+ or alkaline battery-driven portable speakers, enabling longer audio enjoyment with better sound quality. THD+N vs Power (Vcc = 12 V). As a result of its advanced EMI suppression, achieved through the integration of SSM technology, audio devices based on the PAM8106 can avoid the need for expensive filters on the audio outputs and instead use inexpensive ferrite bead filters, delivering further system cost reductions while still meeting EMC requirements. The PAM8106 also features NCPL technology, which automatically adjusts the gain to eliminate clipping at the output signal due to high-level input signals. The PAM8106 also offers low THD+N to provide further speaker protection. Additional protection integrated into the device protects against faults caused by short circuits, and thermal shutdown, undervoltage and DC input protection is also integrated. The PAM8106 is available in a QFN5×5-32L package in quantities of 1000 priced at $0.50 per unit.